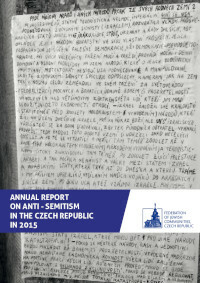 The annual report on anti-Semitism in 2015 (the Report) has been prepared by the Federation Jewish Communities (FJC) forthe internal needs of Jewish communities in the Czech Republic, but also for the needs of other institutions processing the data on anti-Semitism. The Report aims to provide a comprehensive image of anti-Semitism and social climate related to anti-Semitism. The Report brings not only the data from the last year, but also compares recorded manifestations of anti-Semitism with the developments in previous years.